Restopolitan card: pay for one, eat for two! Imagine you’re in Paris for a week with your other half: lucky you! Now, imagine you have dinner every night in a different restaurant and you only pay half the price. Kidding? Not at all. The Restopolitan membership card gives you one free meal everytime you go to a restaurant. Restopolitan card? I know, that doesn’t sound very appealing, right, but who cares? You’ll better recall the name because the concept is great. Behind this odd name stands a restaurant promotion and reservation website, built a bit after the Open Table website most Americans know. There is just one striking difference: Here you have to get a card that gives you one free meal for each booking. At Restopolitan you become member for a week or a month or even three if you like. It doesn’t cost much. 9,90€ for a week, 29,90€ for a month or 39,90€ for three. Your order your card online and it will be delivered to your hotel and only be activated the day of your first reservation. So once you made it to Paris, France, you can choose among 450 restaurants throughout the country with a large number in Paris. You can reserve your table directly on the website or just call a 24-hour service and they’ll guide you in choosing a style of restaurant in the neighbourhood you want. The good thing is: You don’t need to deal with embarrassing situations liking handing a coupon to the waiter and looking so very silly. It’s a very discreet procedure: with booking through restopolitan, so you’ll be able to pay just half the price without your loved one even realizing it. The best thing is: the card is unlimited. That simply means that during the chosen period of a week, a month or three, you can use your card as many times as you like, from Monday to Sunday, for lunch and dinner. Or for both – you’re in Paris after all! There’s one condition though: Only one card is accepted per reservation. Wine is not included, by the way, and the reservation has to be made via restopolitan. Ah, before I forget: they don’t want you to be stingy. That’s why one of the guests must order at least the same amount as the free meal. 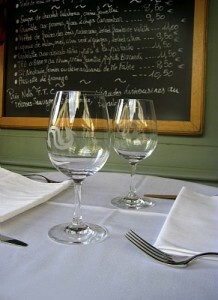 That means: a starter and a main course or a main course and a dessert chosen from the restaurant’s menu. 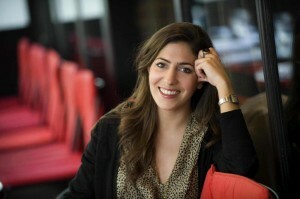 Behind this clever idea stands 29-year old Stéphanie Pelaprat who raised 1 million Euros from French business angels to build up her service. Since she started in September, she has sold 80 000 member cards and her business is already in the black. The only snag comes here: My favourite restaurants are not on the list of restopolitan. Why should they? 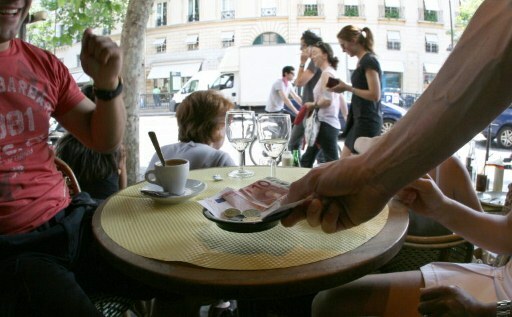 If you offer very good and reasonable price food in Paris, your restaurant generally doesn’t lack customers. On the contrary. The best ones you have to book long time in advance. That’s why being listed by restopolitan doesn’t necessarily mean that this place is definitely worth a visit. But you can have nice surprises though. Just check out Madaboutparis before booking. Stéphanie Pelaprat: good reason to smile!